The Faroe Islands, in the harsh North Atlantic, are part of the Kingdom of Denmark. The diverse community of around 50,000 has traditions dating back centuries and a remarkably low crime rate. Yet the Faroese are often called the last barbarians of Europe. Recent pictures of their slaughter of pilot whales went viral on the internet and in the media. Marine mammals killed and hacked into pieces while children play in the blood-red waters were shocking to many. Unmoved, the Faroese are determined to continue their tradition and devise new weapons for killing the ‘grinds’, insisting that it's no different to killing any other animal for food. The waters on the shores of Denmark’s Faroe Islands turn red in summer. The islanders are keen on preserving a centuries-old bloody practice of whale hunting, which turns small bays in slaughterhouses despite the efforts of activists to stop them. “This is an old tradition, and as you know, there’s some conflict in this, because there are people from outside, from the mainland who don’t like what we’re doing here,” local journalist Finnur Koba told RT. The Faroe Islands are an autonomous country within the Kingdom of Denmark, about halfway between Norway and Iceland where the Norwegian Sea meets the North Atlantic. For their northerly latitude their climate is relatively mild and barely changes between summer and winter, with a mean summer temperature of 13 degrees Celsius and a winter average of 3 degrees. 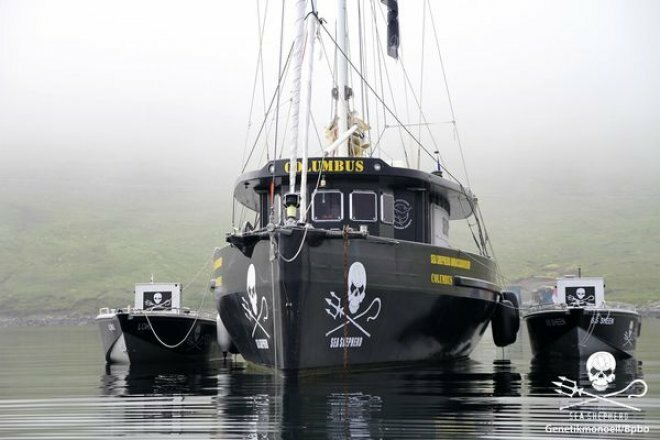 Last month six protesters from the Sea Shepherd Conservation Society were found guilty by a Faroe Islands’ court of interfering with the grind, or whale drive hunts. 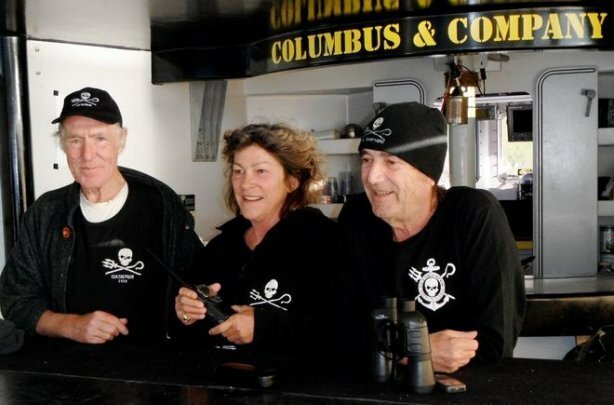 Sea Shepherd was founded by Paul Watson in the 1980s with the aim of halting the practice of killing whales and uses confrontational tactics such as ramming whaling ships. During a whale grind a flotilla of small power boats drive the whales or dolphins into a shallow bay where they are slaughtered with knives, in a process which is part of a 1,000 year old tradition. Although Denmark is an anti-whaling member of the EU and is subject to laws prohibiting the slaughter of cetaceans – marine mammals including whales, dolphins and porpoises – it defends the right of the islanders to practice the grind. Once the whales are in shallow water, people on the shore cut the whales’ neck and try and break the spinal cord and although there is a lot of blood, death occurs quickly. Whale hunting has been a common phenomenon for a long time. It is known to have existed on Iceland, in the Hebrides, and in Shetland and Orkney. Archaeological evidence from the early Norse settlement of the Faroe Islands c. 1200 years ago, in the form of pilot whale bones found in household remains in Gøta, indicates that the pilot whale has long had a central place in the everyday life of Faroe Islanders. The meat and blubber of the pilot whale have been an important part of the islanders' staple diet. The blubber, in particular, has been highly valued both as food and for processing into oil, which was used for lighting fuel and other purposes. Parts of the skin of pilot whales were also used for ropes and lines, while stomachs were used as floats. Rights have been regulated by law since medieval times and references are found in early Norwegian legal documents, while the oldest existing legal document with specific reference to the Faroes, the so-called Sheep Letter from 1298, includes rules for rights to, and shares of, both stranded whales as well as whales driven ashore. Records of drive hunts in the Faroe Islands date back to 1584. Although whale hunting was carried out in other European communities, they have either stopped completely or changed their techniques to cut down on the amount of blood shed. In the Faroes, the islanders still feel a real cultural attachment to the practice and point out that the hunt is primarily for food. Whale meat can be boiled, broiled as a steak or air dried and can even be eaten raw in thin slices. But not everyone in the Faroes is happy with the practice. A Faroe islander, Ingi Sørensen, who also is an underwater whale photographer believes the practice belongs in the history books. “It belongs to the past. In those days it gave us life. Without the grind there would be no life here. But today it’s absolutely unnecessary,” he said. Faroe Islanders watch as men inspect whale carcasses taken during a grind in 1947. Pitting tradition against modern values is something most Faroe islanders are happy to do, Finnur Koba explained. “The tradition is very difficult to explain. It’s something that lives deep inside you, its culture you know. It’s what defines who you are,” he said. However, the long-term yearly average catch of whales is about 800, not enough to dent the large population of pilot whales in the northeast Atlantic, or big enough to make any real difference to the local economy. 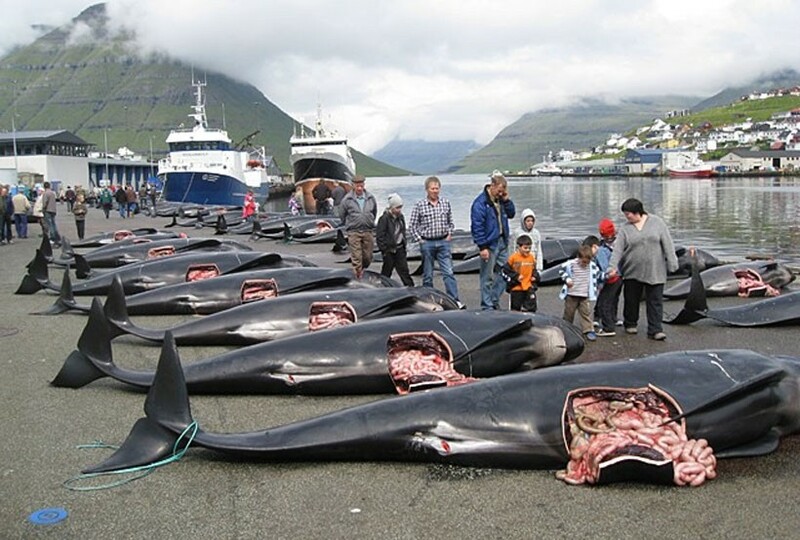 There are no professional whale hunters any more on the Faroe Islands and no one relies on it for their living. All whalers have a day job and when the call to the grind goes out on mobile phones, local radio and social media, everyone tries to get the beach in time for the hunt. One islander explained to the RT crew that he took his daughter to a grind to show her how whales are killed and then cut up for meat. He said he wanted her to understand where food comes from. His daughter was not apparently particularly fazed either way about what she witnessed. The islanders are adamant that they kill the whales as humanely as possible and they point out that they only hunt pilot whales not the bigger killer whales, which in some areas of the world are a protected species. If there is anything likely to put a stop to the practice, it’s not protests by animal rights activists but health concerns as increasing amounts of heavy metal toxins are being found in whale meat. Some Faroe islanders, including the head physician of the islands Dr Pál Weihe, are not enthusiastic about eating it. In 2008 Weihe, alongside the Chief Medical Officer of the islands, advised against human consumption of pilot whale. “The amount of toxins found in pilot whales has not decreased, and we still don´t know much about the long-term damage caused by biological toxins. This is why we warn that pilot whale is not fit for human consumption,” Weihe told a Faroese magazine in September 2013.